Uses Doctors prescribe Lipitor together with diet, weight loss and exercise to lower bad cholesterol and reduce the risk of heart attack, stroke, chest pain and certain types of heart surgery. Lipitor, which is sold under the generic name atorvastatin calcium, is Pfizer’s premier cholesterol-lowering drug. With cumulative sales that exceed $148 billion, Lipitor holds the coveted status of the world’s top-selling prescription drug of all time. Lipitor is a prescription drug used to lower bad cholesterol and reduce the risk of stroke, heart attack, and other heart and blood vessel problems. The U.S. Food and Drug Administration approved the medication in 1996. Its active ingredient is atorvastatin calcium. Lipitor blocks HMG-CoA reductase, a liver enzyme the body needs to produce low-density lipoproteins (LDL), or “bad” cholesterol. By lowering the amount of LDL in the blood, the medication prevents atherosclerosis, a condition in which plaque deposits accumulate on the inner walls of arteries, causing them to stiffen and narrow. In turn, this reduces the risk of atherosclerosis complications like heart attack, stroke, chest pain and aneurysms. The medicine can also raise levels of high-density lipoproteins (HDL), or “good” cholesterol, which protects against heart attack. Some experts believe HDL can carry plaque away from arteries to the liver, which helps to slow its buildup and prevent dangerous blockages in blood flow. Lipitor is the most popular and most potent member of the statin family of drugs, which is the most widely prescribed class of medications in the United States. Pfizer Inc. manufacturers the billion-dollar drug. Doctors commonly prescribe Lipitor together with diet, weight loss and exercise to lower cholesterol and help stave off cardiovascular disease in people with multiple risk factors other than pre-existing coronary heart disease. The FDA approved Lipitor for this use based on clinical trials. In one clinical trial called the Anglo-Scandinavian Cardiac Outcomes Trial (ASCOT), researchers investigated atorvastatin’s ability to prevent heart disease in more than 10,000 at-risk patients. The drug was found to reduce the risk of fatal or nonfatal cardiac events by 36 percent when compared to a placebo. Patients already diagnosed with heart disease take the drug to lower their risk of having a cardiac event. For patients diagnosed with coronary heart disease, the drug can reduce the risk of heart attack, stroke and chest pain while also lowering the risk for heart failure surgeries and hospitalization from congestive heart failure. The medication is also a preventative treatment option for patients with Type 2 diabetes and several risk factors for heart disease and stroke such as high blood pressure, a history of smoking and two diabetes-related conditions called retinopathy and albuminuria, which affect the eyes and kidneys, respectively. The FDA also approved the drug for use in children and teenagers who are 10 to 17 years old and have heterozygous familial hypercholesterolemia, an inherited condition in which cholesterol cannot be removed from the body normally. If diet therapy fails, Lipitor may be used in these patients to decrease the amount of cholesterol and triglycerides in the blood. Triglycerides are fats that can clog blood vessels, and high levels in the blood can mean an elevated risk of stroke. Carefully follow your doctor’s instructions on how to take Lipitor and how often. Never adjust your dose or stop taking the drug without first speaking with your doctor. The medication comes in 10 mg, 20 mg, 40 mg and 80 mg tablets. The tablets are white, oval-shaped and film-coated, and should be swallowed whole. Doctors may start patients on a low dose and then slowly up the dose, but not more than once every two to four weeks. The recommended starting dose is 10 mg to 20 mg once daily. The medicine takes about two weeks to start working. Lipitor comes in four strengths: 10 mg, 20 mg, 40 mg and 80 mg.
It’s normal for a doctor to order blood tests to check cholesterol levels during treatment. He or she may adjust the dose based on the test results. The drug label says patients can take the medication during the day or at night, though it recommends they take it at the same time every day. You do not need to take the medicine with food, but you can if you want too. If you forget to take a dose at your normal time, take it as soon as you think of it, but don’t take two doses at the same time. If more than 12 hours have passed since you missed your last dose, then wait to take the pill at your scheduled time. If you take too much of the medication, call your doctor or Poison Control Center, or go to the nearest hospital or emergency room. When taking Lipitor, it’s important to follow the exercise and dietary recommendations made by your doctor or dietitian. Typically, patients who take the medication are told to eat a low-fat, low-cholesterol diet. The drug’s label warns users to avoid drinking large amounts of grapefruit juice while taking the drug. This means users should not drink more than 1.2 liters of grapefruit juice per day. Grapefruit juice contains one or more components that inhibit CYP34A, an important enzyme found in the liver, and it can increase plasma concentrations of atorvastatin. Experts also recommend at least 30 minutes a day of moderate intensity physical activity such as brisk walking, but talk with your doctor to determine what is appropriate for you. In some people, Lipitor may cause mild side effects such as diarrhea, upset stomach, and muscle and joint pain. Though rare, people have also reported memory loss, forgetfulness, amnesia and confusion associated with statin use. Serious Lipitor side effects include muscle disease called myopathy and muscle breakdown called rhabdomyolysis, which can lead to kidney damage and kidney failure. The risk of these complications rises when patients take atorvastatin at the same time as certain antibiotics, antivirals and antifungals. The medication can also cause liver problems, including fatal and non-fatal liver failure. Signs of liver trouble may include: feeling tired or weak; losing your appetite; experiencing belly pain on the right side of your upper abdomen; and developing yellowish skin and eyes. Studies also link atorvastatin use to an increased risk of developing Type 2 diabetes. 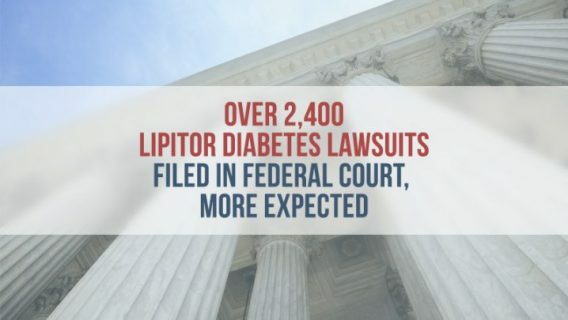 Thousands of people filed lawsuits against Pfizer alleging Lipitor caused their Type 2 diabetes. The Lipitor lawsuits claimed Pfizer knew about the risks but didn’t adequately warn patients and doctors. Many of these complications can occur with all statins, which raises serious safety concerns about the drug class as a whole. People who are allergic to Lipitor or any of its ingredients should not take the medication, according to the drug’s label. Neither should people with liver problems. The label also advises against taking the drug while pregnant or breastfeeding. Atorvastatin may harm an unborn baby, and the medicine can pass into breast milk and may harm a nursing baby. Because Lipitor reduces the synthesis of cholesterol and potentially other biological substances derived from cholesterol, the drug may cause fetal harm if taken by pregnant women. According to the label, women should stop taking the drug right away if they find out they are pregnant. Studies have not established the safety of the drug in pregnant women, and expectant mothers get no benefit from lipid-reducing drugs, the label states. Before the FDA replaced its pregnancy risk letter categories in 2015, it had deemed Lipitor as Pregnancy Category X, indicating that the risks involved with use of the drug in pregnant women clearly outweigh the potential benefits. Pregnancy Category X means studies in animals or humans have demonstrated fetal abnormalities and/ or there is evidence of fetal risk based on human experience.